There were tears, there were cheers and yes, there were some jeers. College football’s National Signing Day was the start of the 2016 season, with the nation’s top high school athletes declaring their allegiance to their favorite schools and conferences. What used to be a day where high school athletes took the next step toward fulfilling their dreams of possibly one day playing in the NFL, it is now a featured event with bells and whistles and media coverage assigned to the best of the best. Who knew 15 years ago that ESPN, Sports Illustrated and other outlets would take the time to create such hoopla and pomp and circumstance? Blame it on the growing “need” to win in college athletics and blame part of it on the NFL, an entity that looks long and hard at football players who are bigger, stronger and faster than they were when the likes of Joe Montana and Dan Marino were slinging footballs on Saturday afternoons. Here’s a little sample of college news this week. Rashan Gary surprised few people when he announced he would be playing football in Ann Arbor this spring. The nation’s top-rated player, and a solid defensive tackle, made his announcement on Wednesday. It was reported that Gary picked the Wolverines and head coach Jim Harbaugh over Clemson, but did receive offers from other schools. 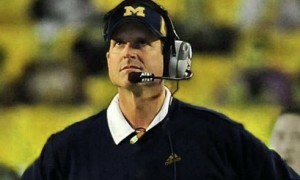 Harbaugh is in his second year with his alma mater, and has given the Big Ten a shot in the arm. For years, the top prospect in the country signed down south. This might be a sign that the recruiting playing field is leveling out. Michigan wasn’t the only school to celebrate its signing day with the nation’s top talent. 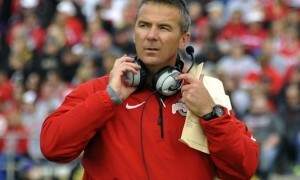 ESPN.com is reporting that FSU could very well have the best recruiting class of 2016. Texas, LSU, and Alabama had solid days as well. Florida State, which began signing day at No. 3 in ESPN’s class rankings, vaulted LSU and now stands among the best classes after landing ESPN 300 prospects Carlos Becker, Landon Dickerson, Dontavious Jackson and Brian Burns. Despite adding third-ranked cornerback Kristian Fulton and seven of the top 10 players in Louisiana, LSU dropped from No. 1 to No. 3; Alabama also passed the Tigers in the class rankings. The Seminoles already had a solid team returning in 2016 and this class should further define them as coach Jimbo Fisher could have his team in line to compete for another national title. FSU won it all in 2013. Not everyone was excited about National Signing Day. Sometimes, missing out on a top recruit will cause a coach to say something that really stands out. Such is the case of Arkansas’ Bret Bielema, who voiced his opinion about the recruiting on the campus of both Florida and Ole Miss. The comments were found on Rob Cassidy’s Twitter account. According to Chadd Scott of Gridironnow.com, Bielema was not pressed during his ESPN 2 appearance regarding exactly what he meant when he made that statement. Arkansas is expected to sign a class that finishes between 20th and 25th. Arkansas hosts Ole Miss October 15th and hosts the Gators November 5th. The Rebels, who are coached by Hugh Freeze, has been the subject of rumors all season with their recruiting and players in their program. News of the Rebels receiving an official letter of inquiry from the NCAA regarding a handful of past football violations was made public last week.